De’VIA Panels 2014 25th anniv. 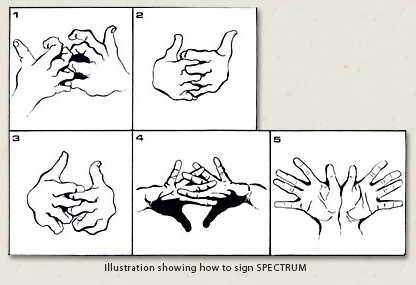 Spectrum was a Deaf artists colony in the mid 1970s that predates the coining of the term Deaf View/Image Arts but it was important in the evolution of the term, concept and assertion of a genre about the Deaf experience. Note: This is a summary of the signed commentaries made in the video on Spectrum and not a verbatim translation. Text summary by Karen Christie and Patti Durr. See video for all of the images mentioned below. Chuck Baird: This was a new place where a variety of us Deaf artists could come together and do our thing. Such a thing had never existed before. A Hearing woman from Texas came here to start an art program for disabled kids. She was concerned about accessibility issues in the arts. 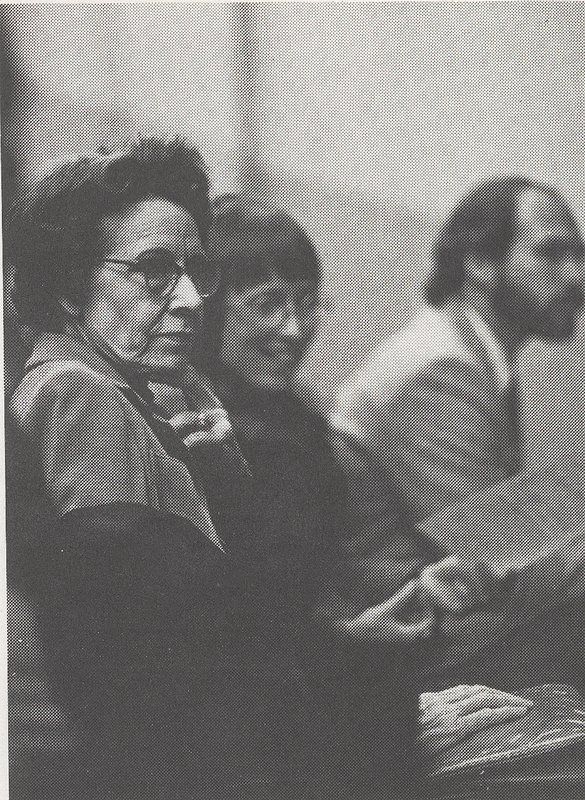 Betty G. Miller: Janette Norman, her namesign was a “J” on the palm of the hand, showed up at Gallaudet. I met her and she explained her idea about setting up a Deaf artists program, which I became fascinated with. I began to tell my Deaf friends about it and some of us decided to make the big move to Austin, Texas. Chuck Baird: Janette Norman came to us and asked us Deaf artists, “What dreams do you have?” We all looked at each other and said, “We’d like to have something like a Deaf artists’ colony,” and she returned to Austin and found some people with money. Then she notified those of us Deaf people who she had met in Washington, DC. Paul Johnston: Chuck Baird had just graduated, and went to participate in the World Federation of the Deaf (WFD) convention. It was there that the idea got percolating about founding a Deaf artists’ center; a “utopia” so to speak. They decided to establish it in Austin, Texas. That was Spectrum. Betty G. Miller: Some friends and I came out to Austin, Texas. Chuck Baird: At that time we wanted to showcase the talents of Deaf artists nationally; to share their accomplishments and frustrations and how to make it across the communication barrier as some artists had done. We would publicize this via our newsletter, and we acted as a clearinghouse. Spectrum really served as an umbrella under which many of the projects were housed: theatre, TV & film, visual art, literature and dance. Spectrum had different projects for schools, and hosted art shows and theatre productions involving Deaf children and families. 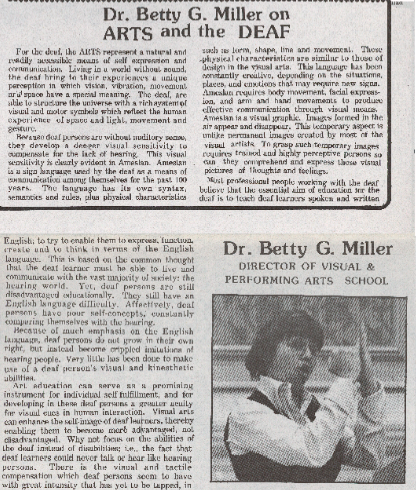 There was a summer camp for Deaf youth related to the arts and theatre. This is how we served the Austin community. 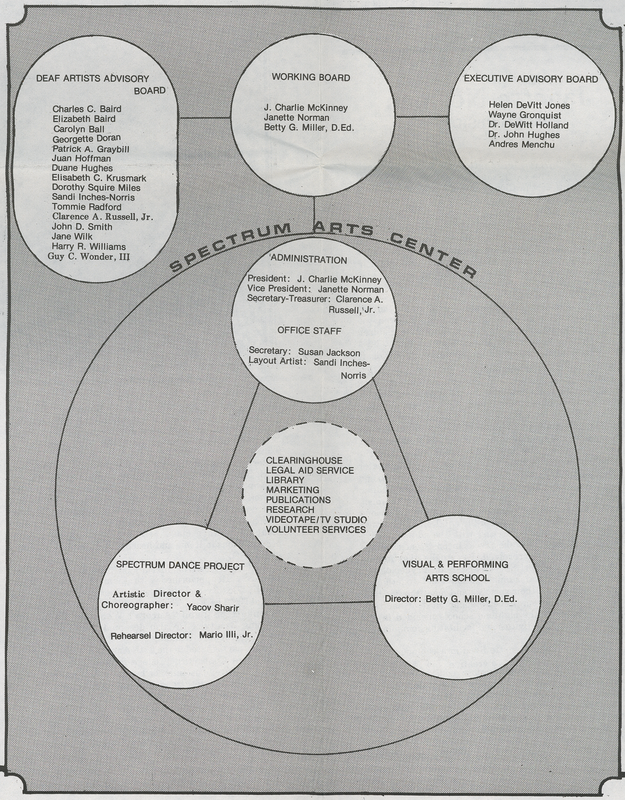 [Image of Spectrum’s organizational structure and representatives in 1977. Chuck Baird: We got a federal grant for job training called CETA under Jimmy Carter’s administration. This was awesome, and for two or three years it allowed us to expand and grow. Many Deaf people from across the U.S. were thrilled to see what was happening here in Austin — something founded by, for and of Deaf artists, with a few Hearing people involved as interpreters or for fundraising and development. We, Deaf artists, were able to see ourselves as visual artists, theatre performers, writers and dancers. Nancy Creighton: She (Helen DeVitt Jones) was from a wealthy oil family and Spectrum was just one of her minor philanthropies. Her money paid all of the salaries for Betty, Charles, and Janette. CETA money covered everyone else, including myself. I believe when Helen Jones’ sister – or someone in her family – was dying, and they needed to reconfigure their finances, so she had to stop supporting Spectrum. Betty G. Miller: My friend, Clarence Russell, and I brought the ranch together. 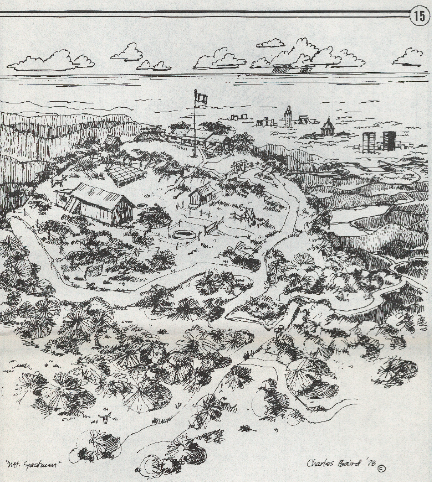 Betty G. Miller: The Ranch is where we had many of our Spectrum activities. We had Deaf artists there. 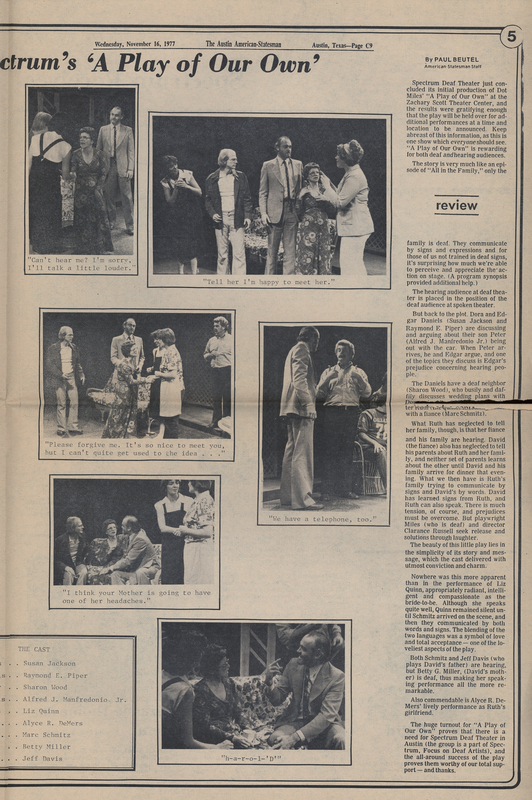 Not everyone made works that were Deaf-themed, but there was a focus on Deaf life and providing Deaf artists with an opportunity to move forward with their artistic lives. Chuck Baird: Welcome to Spectrum (fingerspelled and then signed) ranch. A group of us came together here to form the organization Spectrum: FODA — Focus on Deaf Artists. That (indicating building behind him) is where we would have meetings in the living room. The den became an office space; there was a kitchen, and down the hall was the bedroom area. This building belonged to Betty G. Miller and Clarence Russell, whose name sign was CR. At this time, many people were moving to Austin, and those two bought this area, which became our “headquarters.” Over there a bit was a small horse stall that we converted into a studio for producing our newsletter; doing the layout and illustrations, collecting slides, preserving materials and so forth. We also had a small outdoor stage, which was a platform. We had a home-made tent, which I made, and we erected it during the summer festivals where forty-plus Deaf artists would all convene for one-week. It really was our hey-day. We had a wonderful time. The first summer festival was in ’77 and the next one was in ’78. The second was a little larger, and took place here. Most people came from out of state and would stay with us as guests; we’d come together and leave and come together again. We also had an outdoor evening theatre with lights and people would flock to see it. There was about fifteen of us working here during the day with the two owners staying in the ranch house. Now there are many buildings here and guess what this has become? The Austin Zoo — believe it or not! Paul Johnston: I met Betty Miller and we kept in touch. She invited me out to visit Spectrum. This was during my senior year at RIT. I flew out and was really just an observer, chatting with people without having any real role or responsibility in Spectrum, as I was still a senior. When I visited her at Austin, Texas she showed me her portfolio at her home. Chuck had already mentioned what a phenomenal artist she was. I think Chuck had even shown me some pictures of Betty’s work — like a face with wires coming down from the ear and mechanical instruments. I could see how her work influenced Chuck’s work with his “The Mechanical Ear” painting. It was not a direct influence, but more of something that rests in the subconscious. It is typical for someone’s art to impact others from the same school of art. When she showed me her work, I thought wow — it was so strongly political. At that time, writing did not have a big effect, whereas art produced a much more powerful statement. 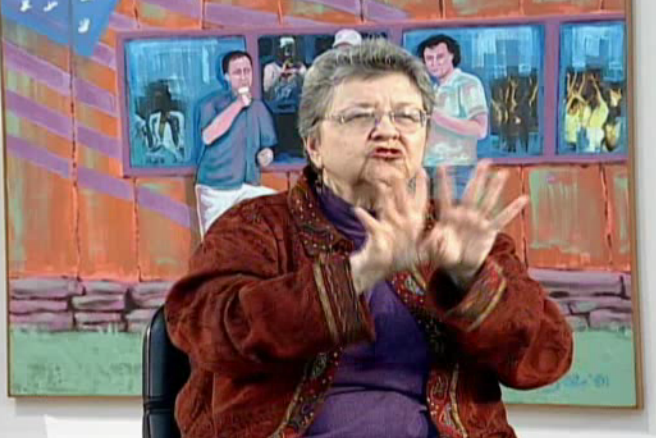 Nancy Creighton: Liz Quinn sat me down and explained, “ASL is different. ASL is a visual language. You sign ENGLISH. We are STRONG ASL here.” She explained it all to me and I replied, “Thank you for teaching me because I’m totally clueless.” Although I realized at the time that their emphasis was on using ASL, it wasn’t until years later that I found out that everyone using and promoting ASL was a very radical and unique idea for that time. I didn’t know it then. I didn’t know anything about the history. I didn’t know anything simply because I had grown up entirely in the Hearing world. It wasn’t until much later that I realized how fortunate I was to have been exposed to that so early on. 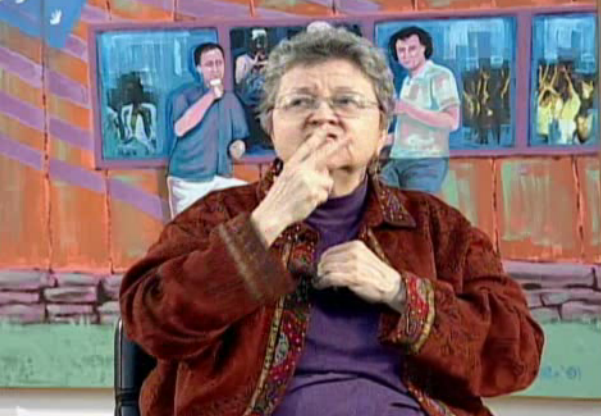 Chuck Baird: In the living room of this house, we would have lively discussions about Deaf art lead by Betty G. Miller. Ten years later, De’VIA would be formulated but really its birthplace was right THERE through that door. Betty was really ahead of her time. De’VIA was coined later. Wow, I’m moved to see that coming towards me. (cuts to peacock walking towards Chuck) See that peacock there — you know how its back feathers will open up just like the sign for Spectrum. Far out, huh? Spectrum; it was colorful. It is like the feathers of that bird. We had a stage, a platform here. I would say it was 30 by 30 feet. I remember there was a telephone pole that had an electrical outlet, and we powered the lights from it. This building used to have horse stalls, as I told you before. We converted it into a studio space for layout work and a darkroom. It took us one year to renovate the building because it was stop and go depending on the funding coming in, which enabled us to buy the supplies, such as wall board. Five or six of us worked here in this space: our editor in chief, our photographer, another person who was responsible for the newsletter lay-out, and someone who typed up the articles. Betty Miller: This is a painting of a building that was part of Spectrum ranch. It was not the building we lived in but rather one in which we did various activities. There are three different artists featured in the painting. The man on the right is Clarence Russell (CR), the man in the middle is Reggie Egnatovich (name sign – R on the chin), and the man next to him is Guy Wonder. You may have noticed that in many of my paintings I have lines running down from the mouth to the bottom of the chin — this is to indicate they had been raised orally. This man in the middle was VERY Deaf, which means he was ‘very ASL,’ but still he had been raised being required to speak. In the background, you can see an American flag where the stars have been replaced with hands. This shows that we were AMERICANS — not just some folks out in the world, but that we were part of the U.S.A.
us. I learned to appreciate dance, and I hadn’t seen Deaf dancers prior to Spectrum. Meeting so many Deaf artists was really inspirational for me. Even though we had many conflicts, as a whole it was remarkable. We were all brave Deaf people to move from our homes to start such a venture. Now, when I look back I’m in awe. Since that time, I have never seen anything like it.